Goldsheet.com handicapper Bruce Marshall breaks down Week 3 of the 2018 NFL season. 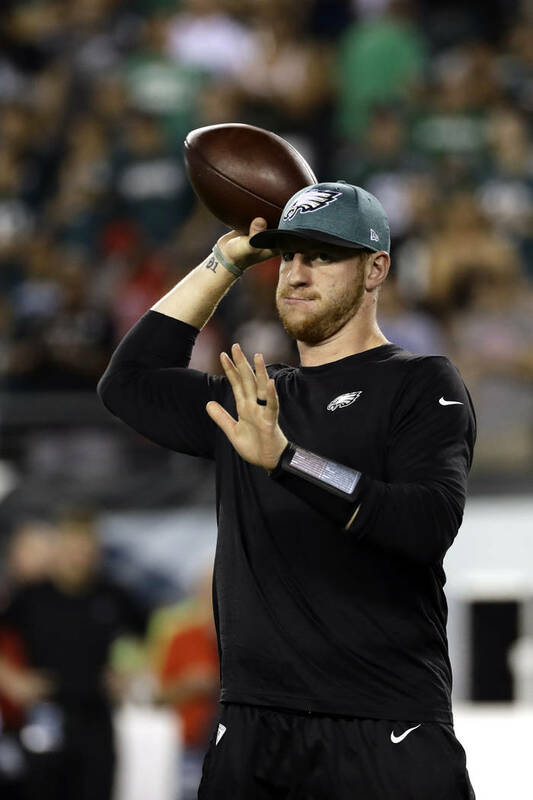 Analysis: Another unconvincing effort by Nick Foles in a loss at Tampa Bay has hastened the return of Eagles quarterback Carson Wentz. 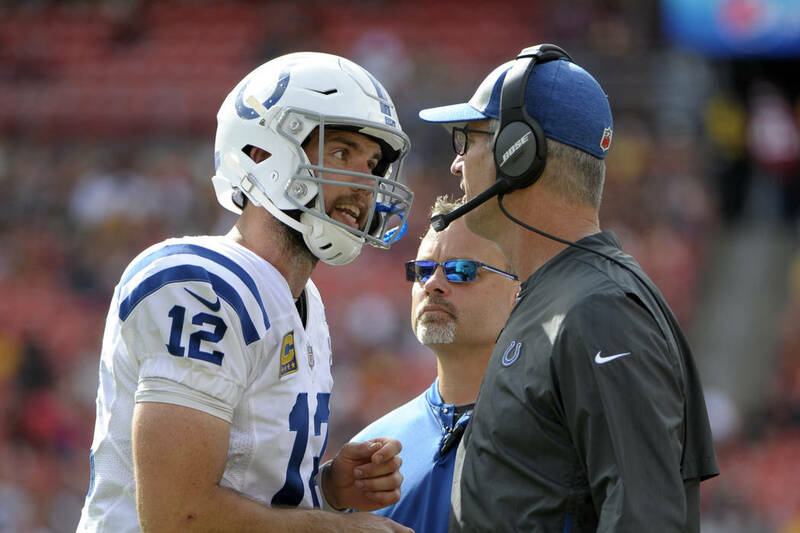 But he has plenty of rust to work off, and nothing he does is likely to surprise new Colts coach Frank Reich, who was the Eagles’ offensive coordinator during their Super Bowl run. 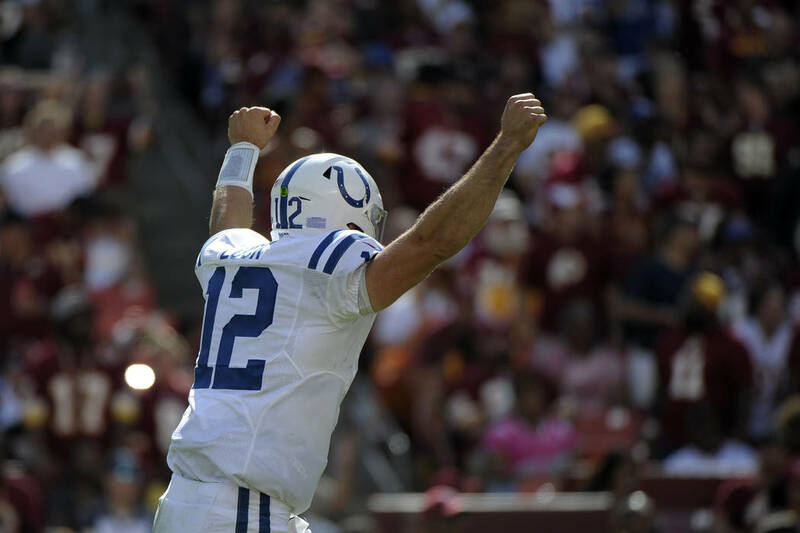 A healthy Andrew Luck led the Colts to a wire-to-wire win last week over the Redskins. By the numbers: The Colts were 11-5 against the spread as underdogs from 2013 to 2015 with a healthier Luck. … Philadelphia is 14-4-1 ATS at home under coach Doug Pederson. Analysis: Carolina was down two injured starters in the secondary in last week’s loss at Atlanta. 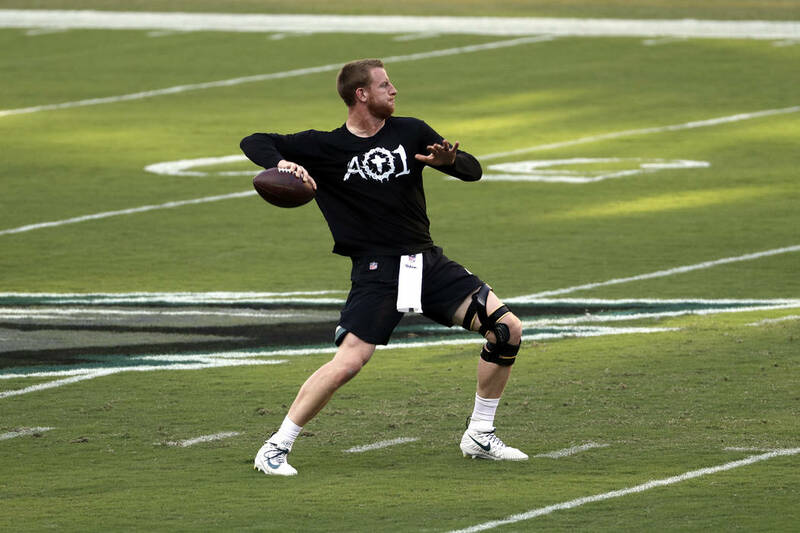 But the Bengals also have injury concerns, and the absence of RB Joe Mixon could impact the delicate balance Andy Dalton has rediscovered for Cincinnati’s offense. Not sure the Bengals’ robust defensive line can chase down Cam Newton, whose mobility vs. Geno Atkins and friends should be a plus. By the numbers: The Panthers were 5-8 as home chalk the past two seasons before covering in a season-opening win over Dallas. … The Bengals have gone over in their last three games. Analysis: Tennessee rookie coach Mike Vrabel has his first win, but his upside is limited if he’s forced to continue using Blaine Gabbert at quarterback while Marcus Mariota rehabs his sore elbow. Any chance Jacksonville has a letdown after its rousing win over the Patriots is negated by its revenge motive vs. Tennessee, which beat the Jaguars twice last season. By the numbers: Tennessee won and covered both meetings last season. … The Titans are on an 0-4 spread slide as road underdogs. Analysis: Maybe the Saints can use a road trip after performing as if they had hangovers from a couple of nights in the French Quarter vs. the Buccaneers and Browns. And perhaps Drew Brees misses suspended RB Mark Ingram more than expected, as Alvin Kamara has yet to replicate his rookie exploits. But Brees has beaten Atlanta many times over the years and has WR Michael Thomas (28 catches) on pace to shatter NFL receiving marks. By the numbers: The Saints are on a 10-5 cover streak as underdogs in the regular season. … Atlanta is on an 8-1 under uptick. Analysis: Denver also started 2-0 last season before losing 11 of its final 14 games. There is a different feel about this Broncos team with Case Keenum providing leadership at quarterback that’s been absent since the Peyton Manning years. But Denver is on a 1-9 spread slide on the road. Expect a more focused effort from the Ravens, who have had three extra days to stew after their 34-23 loss to the Bengals. By the numbers: Denver went 1-7 ATS on the road last season. … The Ravens are on a 7-3-1 over surge at home. Analysis: The “new” Giants offense under Pat Shurmur is having trouble outscoring the Yankees, much less NFL foes. Shurmur might want to have Eli Manning look downfield a bit more instead of consistently feeding rookie RB Saquon Barkley. Houston is finding ways to lose for uninspiring coach Bill O’Brien, and QB Deshaun Watson has yet to recapture any of his rookie magic as the Texans are barely scoring 18 ppg. By the numbers: The Texans have lost eight straight games. … The Giants are on an 8-1 under run. Analysis: Miami QB Ryan Tannehill has begun to find the sweet spot he had in Adam Gase’s offense before his previous knee injury in 2016. 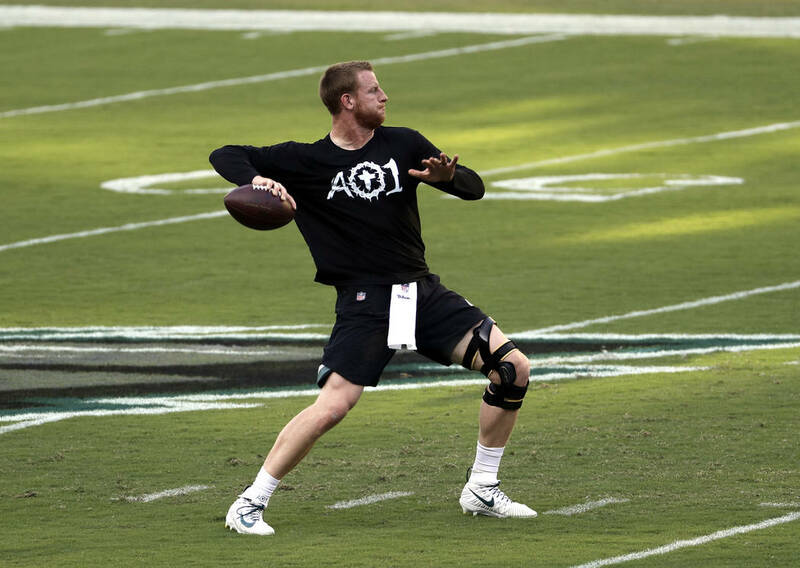 But it has helped the Dolphins’ cause to face a struggling foe in the Titans and a rookie quarterback in the Jets’ Sam Darnold. The former might apply to Oakland, but not the latter after QB Derek Carr completed 29 of 32 passes in Denver. By the numbers: The Raiders are on a 3-10-3 spread slide. … Oakland is on a 9-0 under streak. Analysis: Washington opened the season with a 24-6 win at overmatched Arizona. 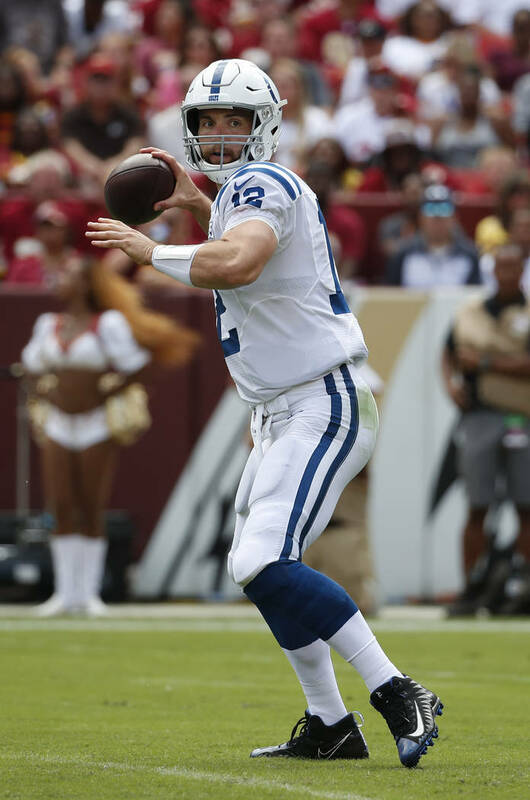 But that might have been the real Redskins we saw in last week’s home loss to the Colts. Aaron Rodgers is playing through his knee injury and isn’t facing an elite defense as he did last week against the Vikings when he completed 30 of 42 passes and managed to sustain drives despite his limited mobility. By the numbers: The Redskins are on a 6-0 under run after a 24-9 over streak. … The Packers are riding a 26-11 over uptick. Analysis: Other than perhaps an emergency call for a kicker after Daniel Carlson missed two late field-goal tries that would have beaten the Packers, the Vikings don’t have much to worry about here. After all, Buffalo is risking relegation to the Canadian Football League after an 0-2 start that includes starting cornerback Vontae Davis retiring at halftime of last week’s loss to the Chargers. RB LeSean McCoy also was knocked out last week with a rib injury. By the numbers: The Bills are on a 22-12 over run. … The Viking are on a 12-1 cover streak in the regular season. Analysis: The Chiefs also enjoyed an explosive opening last season, when they started 5-0 before losing six of their next seven. The upside for QB Patrick Mahomes is considerable, but the 49ers have a bit of swagger with cornerback Richard Sherman now on board and QB Jimmy Garoppolo 6-1 as a starter. With RB Matt Breida providing balance, Kansas City might hold back on some of its preferred blitzing. By the numbers: The Chiefs are on a 7-2 cover run as regular-season hosts. … Garoppolo is 7-2 ATS in nine career starts. Analysis: Full respect for QB Philip Rivers and the Chargers, but this is the best-looking Rams squad in 50 years. The Cardinals could have played all week and not scored against the Rams, whose defense is frightening now with Pro Bowlers Ndamukong Suh, Marcus Peters and Aqib Talib joining Aaron Donald. The Rams can hurt an opponent in lots of ways on offense, and coach Sean McVay does a great job getting them ready. By the numbers: The Chargers are on a 26-12-1 cover streak as road underdogs. … The under is 8-3 in the Chargers’ last 11 road games. Analysis: Want to be careful here, as this could be an example of the old NFL zigzag theory. But the Cardinals look helpless, and we can’t envision things getting much better with Khalil Mack in Sam Bradford’s face. Without a downfield passing game, defenses can more easily key on RB David Johnson. Bears QB Mitch Trubisky is working his way through the NFL learning curve, but he has weapons and is playing for a coach (Matt Nagy) who knows what he wants to do. Arizona coach Steve Wilks doesn’t seem to know. By the numbers: The Cardinals are on a 14-5-1 under run at home. Analysis: This isn’t the same Cowboys that we’ve seen in the past 50 years with explosive receivers from Bob Hayes to Drew Pearson to Michael Irvin to Dez Bryant. Now, owner Jerry Jones is looking for help from the waiver wire to provide targets for Dak Prescott. And Dallas’ reconfigured offensive line isn’t opening holes for RB Ezekiel Elliott the way it did in 2016. Seattle QB Russell Wilson will keep the Cowboys’ defense on its toes. And even the Seahawks’ post-“Legion of Boom” secondary has enough to keep Dallas’ limited air threat grounded. By the numbers: The Cowboys are on a 10-1 under run. … Dallas is on a 1-4 spread skid as an underdog. Analysis: It’s hard not to like the Patriots, who have a 25-7 spread record after a loss. The Lions trailed the 49ers 30-13 last week before rallying for a backdoor cover. We’re still anti-Matt Patricia. The rookie Detroit coach’s game and clock management was poor, and the Lions aren’t as good or as happy as they were with coach Jim Caldwell. By the numbers: The Lions are on a 2-7 spread skid as home underdogs. Analysis: The Steelers don’t have a good defense, but they still have QB Ben Roethlisberger. QB Ryan Fitzpatrick is bound to cool off, and we don’t think the Bucs can win a shootout with Pittsburgh. But we think it will be a shootout and the total of 54 might not be high enough. By the numbers: The Steelers are on a 3-5 ATS skid as road chalk. … Tampa Bay is on a 5-0 cover run as a home underdog.